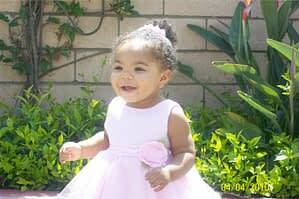 My baby girl Kamryn Faith, 16 months old, passed away from Myocarditis on August 28, 2010. Our story sounds very similar to all the stories Ive seen about the disease so far. There were no symptoms; no warning that would have caused me to be alarmed prior to August 27th. That afternoon she was breathing differently than normal, not enough to cause me to panic but enough for me to notice. She started making this grunting noise as she breathed so I took her to the base’s ER and they ultimately said she had bronchiolitis and sent her home with instructions to return if she got worse or to follow up with pediatrics on Monday. I never went home, instead I took her to another ER in Oceanside, CA and they saw that her heart was enlarged and recommended that she be transferred by ambulance to a hospital with a pediatrics wing. When we got into the ambulance it was the last time I ever had the chance to hold my baby girl. When we got to the next hospital 45 minutes away she had already gotten worse. The doctor’s there assumed that she had swallowed something and was completely focused on that; they never once looked at her heart. They kept telling me she would be ok as I stood there for hours watching my baby die (I know that now but not then). They decided they needed to take a look inside her lungs to rule out whether or not she had swallowed something. By the time they got her to surgery she was so weak because she had been struggling all nigh to breathe. I asked was she going to be ok to go into surgery, they said yes, I asked why her heart was beating so fast and they told me it was because she was fighting them so hard. (That whole night she kept trying to turn over and lay on her stomach but they would not let her so every 5 minutes or so she would try and they would turn her back over). About 20 minutes into the surgery I started to see her doctors and nurses running at full speed back to the OR and I knew that something was wrong. It took another 20-30 minutes before they came out and told me that she was in heart failure and that they were doing everything they could to save her but they wanted to prepare me for the possibility that she may not make it, and then they left and I called my Mom and we prayed on the phone until the connection was lost. The next time I saw them they were telling me that my little Kamryn Faith had died…. now what. I have 3 older kids 15, 12, and 5. My husband was deployed to Afghanistan. It was only 2 weeks until he would be coming home. She was only 8 months old when he left and now he will never see her again. I couldn’t even begin to imagine how I was going to tell him that she was gone. The last time I had talked to him was at the 2nd hospital and he didn’t know that we had been transferred to another one or that she had gotten worse or anything. I had to tell the kids, my parents, his parents and I had to try to keep it together enough to talk to the coroner and a host of other people that the hospital sent my way. I got to go see her and talk to her and all I could say was how sorry I was because I was the one who was supposed to take care of her and now she was gone. Everyone keeps telling me there was nothing I could do but I am having a very hard time believing that. Just by reading the posts on the Foundations website I see that this disease is one that strikes without warning. Thank you all for sharing your stories, mine is just beginning and I hope that things have become easier for you all with time. People keep telling me that will happen so I hope its true.